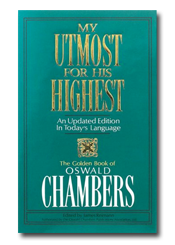 My Utmost for His Highest is a classic of devotional literature. One of the most enduring bestsellers of our time, this book has touched the lives of millions, leading them into a deeper and more passionate walk with God. Shedding fresh light on the Scriptures, Chambers explores the depths of our humanity and our profound need for a God-focused life.